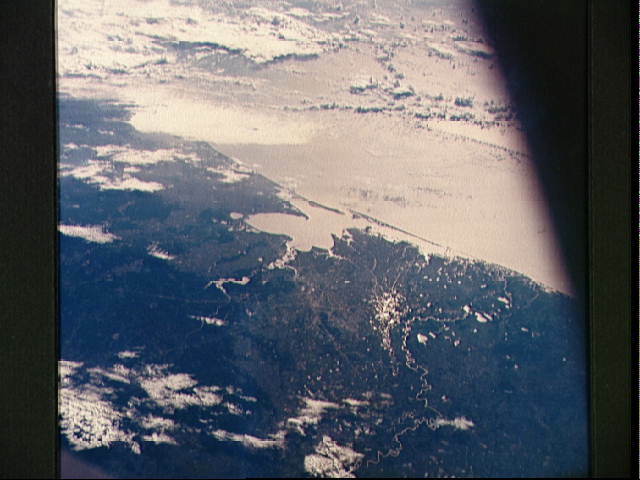 The Houston, Texas and Gulf Coast area, looking southeast, as seen from the Apollo 7 spacecraft during its 91st revolution of the earth. Photographed from an altitude of 101 nautical miles, at ground elapsed time of 144 hours and 26 minutes. The morning sun causes a reflection on the water surfaces such as the Gulf of Mexico, Galveston Bay, Buffalo Bayou and the Brazos River and causes a unique reflection in the canals and fields west of Alvin. Some of the landmarks visible in this picture include highways and freeways, the Astrodome, the Intercontinental Airport and the Manned Spacecraft Center.